The memory of the communist era in Romania, questions about the revolution and the end of the Ceauşescu regime. An interview with Corneliu Porumboiu, screenwriter and director of the critically-acclaimed film "12:08 East of Bucharest"
It is the 22d of December 2005. 16 years after the revolution, in a small village east of Bucharest, the director of the local TV channel is looking for an answer to a question that has been haunting him for years: "Was there really a revolution in this city?" 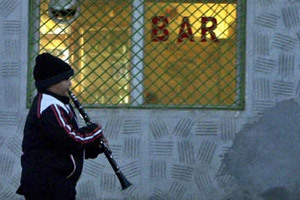 Corneliu Porumboiu's "12:08 East of Bucharest" (original title in Romanian: "A fost sau n-a fost? "), won the Camera d'Or Prize for best first film at the Cannes Film Festival in 2006. Where is "12:08 East of Bucharest" set? In the place where I was born, Vaslui, a small city with 70,000 inhabitants in Eastern Romania. Where did the original idea for this film come from? From a TV show that I saw in Vaslui, then years after the revolution. The show was exploring the idea of whether there had been a real revolution in the city or not. 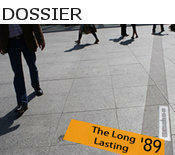 In Romania, what was the relationship between the media and the events of 1989? I think it was the first historic event that was ever broadcast live on television. Many Romanians followed the events of the revolution on TV. In my film, it was essential to me to show different perspectives on those events and to show how each one of us distorts history. Nowadays, what kind of attitude does Romanian society have towards that period? Each generation has a different perspective on it. If you ask teenagers or those born around 1989, they wouldn't be able to tell you much. They focus on the future. My generation, which is now in its thirties, is caught in between. Romania is changing very fast, there is a deep division between the generations. Each one has different role models and fights different struggles. I was 14 years old in 1989. People like me have memories of the communist era, but they live in modern Romania. My parents' generation, the one that truly lived that era, is still struggling to adapt. Would you say the expectations created by the revolution have been met, twenty years later? It depends on the way you look at it. Revolution is a very dramatic word. I don't think there are events that can change everything in just one moment. After the revolution, tradition takes over, and then society eventually changes once again. This is what I wanted to prove with my film. History books say that the revolution changed everything in one day, but we know it wasn't exactly like that. Who are the winners and who are the losers in the Romanian revolution? I don't think there are winners or losers. It depends on each one of us, on how much we managed to adapt and understand the new world that was beginning at that time. As regards coming to terms with the dictatorship of the past - and its crimes - what is the most common attitude among Romanians nowadays? A character in your film is an ex-agent of the Securitate who becomes an entrepreneur. Are there many similar stories in Romania today? What is these people's role and what kind of influence do they have? It is very difficult to establish since we don't know exactly who was doing what during that time. The law simply states that representatives of the old regime, and its politicians, cannot hold any public role. In Romania, the events of 1989 were characterised by strong violence. This wasn't the case in other countries. Why? It's true. Ceausescu's regime reacted very violently to what was happening. In Timişoara there were more than 70 casualties, then the focus moved to Bucharest on 21 and 22 December. In other countries like the Czech Republic or Poland, some sort of alternative had already taken shape in preceding years, but not here. Some thought that change could be avoided, and that triggered the violent reaction. What has changed in Romania since 1989? Is there still a division between Eastern and Western Europe, 20 years after the fall of the Berlin Wall? How is that perceived in Romania? There is a lot of talk about it. What's the most common opinion? Isn't there a point of view that is, in general, shared? No. The same can be said about the Italians that came here as entrepreneurs. There are different opinions about them too. In your films, both in "East of Bucharest" and "Călătorie la oraş" (A trip to the city), you show a Romania made of small villages where time seems to have stopped. Is it really like that? I tell stories about the world I personally know, and since I come from a small town, I know well that reality. It is true that things are changing much more slowly in the small villages. There is also a different perception of time and great historical events. Romanian cinema has proven to be very lively in the last few years and has won many prizes at the international level. Mungiu, Nemescu, Puiu and yourself are good examples of this. Is this a new wave of cinema or just the sum of single, unrelated projects? I don't think it is a new wave, or at least it hasn't been planned as one. We don't share any dogma. Though, at the same time, we share a certain type of cinematic taste. We make films about real life with characters who are normally not represented; films about modern Romania. Most of all, as opposed to what was happening before the revolution when Romanian cinema was one of the regime's most powerful propaganda tools, I'd say we try not to distort reality. That's why our style of filming has some things in common. Abroad, some have compared us to Italian Neo-realism. In general, I'd say we share a common vision about cinema, but we don't have a shared agenda. Are you influenced by the fact that you were all children during Ceauşescu's regime? Of course. We are the generation in between, the one that wanted everything to change very quickly. Then we realised that that wasn't happening. I think we have the same psychological approach to cinema. Your film ends leaving the opening question unanswered. So, was there a revolution in Romania, or not? Yes, there was, but at the same time it depends on the way you look at it. Everyone lives his own revolution. This is my opinion. I can't say whether there was a revolution or not. I was 13. The character based on myself in the film is the TV cameraman. At the beginning, he tries to find the truth in all the different versions of the story he is given, then he lets the camera fall and at the very end he doesn't know what to think anymore. When I made the film, I was most of all interested in capturing the different opinions on the revolution, the personal stories and destinies. In the end, the truth is that I don't know how to answer this question. Was there a revolution for you?